Ashabodai was Queen of the Amazons and a powerful Dragovinian in the Xorian Empire. After the previous Queen Anajakaze died, Ashabodai ascended the throne by besting her competitors through skill of arms as is tradition. She played the subordinate matriarch to King Jevaninada II during her reign, rarely challenging out or contradicting him. During the Second Alliance War she led her Amazon warriors against the soldiers of the Alliance. Ashabodai perished during the Battle of Phoenix at the hands of Logan the Warlock. She was succeeded by Queen Jittehalong, who is not a Dragovinian but still serves the Xorian King. Ashabodai was born to an Amazon of noble bearing during the reign of Queen Anajakaze but before the marriage of Amazonian and Xorian leaders and fates. Ashabodai’s mother supported the Queen’s decision to end the wars with Xoria through marriage. This action secured the favor and respect of the newly joined royal family and ensured an easy, prosperous life for Ashabodai. That is, if her mother had allowed it. Her mother did not indulge any desire of Ashabodai’s. The girl joined the agoge like everyone else her age, learning mathematics, poetry and gymnastics. Ashabodai loved gymnastics and the poetic descriptions of rhetorical speeches and Homeric combat, but detested learning mathematics. She grew into a strong young woman and when the time came for her to master weaponry she chose the single-handed battlaxe saying, “Whatever Penthesilea can do with two hands, I can do with one.” Ashabodai embraced the rage and power of her ancestors during battle, unlocking a powerful battle furor. She quickly became known as the strongest warrior of her age. Her mother died during the attack on Crafterton in 437BCE and Ashabodai rose to take her place as one of Queen Anajakaze’s favored few. Ashabodai participated in the quelling of revolts throughout the 420s, distinguishing herself through her leadership under pressure, courage, and martial prowess. By the time of the slave rebellion in 424BCE Ashabodai was in charge of the Amazons’ left flank. When Anajakaze died at the hands of Blendegad the Reaper, Ashabodai returned to Dradelden for the quasi-religious tournament that determined the next leader of the Amazons. Ashabodai defeated all comers and claimed victory. Her golden laurels came with another prize from King Jevaninada II himself as well, Dragovinian status in Xoria’s new heirarchy. Ashabodai followed Jevaninada’s every order and rarely left his side. She was there during the hurricane of 401BCE and she was there when Blendegad attempted to accelerate his divine growth through the consumption of artifacts. 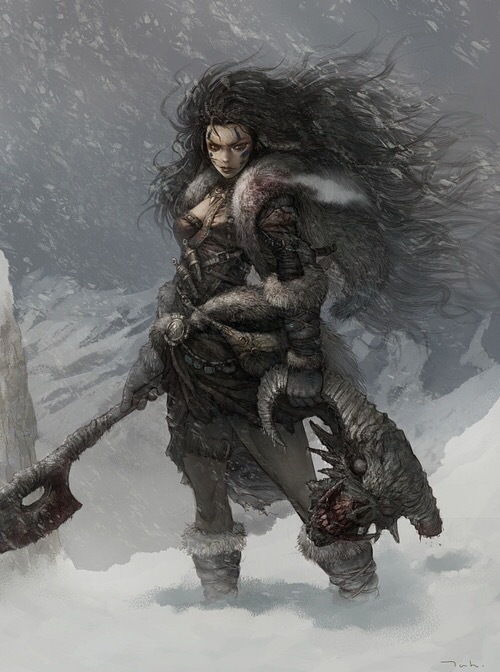 After Blendegad threw up the Fierce Axe of Dwarvish Lords Ashabodai picked it up and claimed it as her weapon. Ashabodai periodically forayed into Bigby’s Forest to find the Rebel Base and was constantly accosted by flying Elves. To allow her to continue her work, Jevaninada gifted the Amazon Queen with a crown that prevented people from flying higher than ten feet when they were close to her. Ashabodai used this crown to slay many Elves but she never found the Rebels’ hideout. Ashabodai participated in every major battle of the Second Alliance War. At the Siege of Phoenix she successfully prevented breakouts by running Alliance soldiers down with her Amazonian cavalry. When the Siege of Phoenix turned into the Battle of Phoenix, Ashabodai joined the aristeia between the other high ranking Dragovinians and the Alliance Council members. Ashabodai performed admirably but lost her life to Logan the Gazearan Warlock. Her body was taken by the Alliance, stripped for war spoils, and turned to ash. After Ashabodai’s death two trounaments were held to decide the next Queen of the Amazons, one at the warcamp outside Phoenix and one in Dradelden. Two champions were crowned and then they fought in a duel to the death. The Dradelden champion, Jittehalong killed her opponent and took victory. She has refused Dragovinian status numerous times but continues to obey Jevaninada II’s orders, for now.